Our growing range of 10mm SF buildings is expanded today with the addition of three new models. 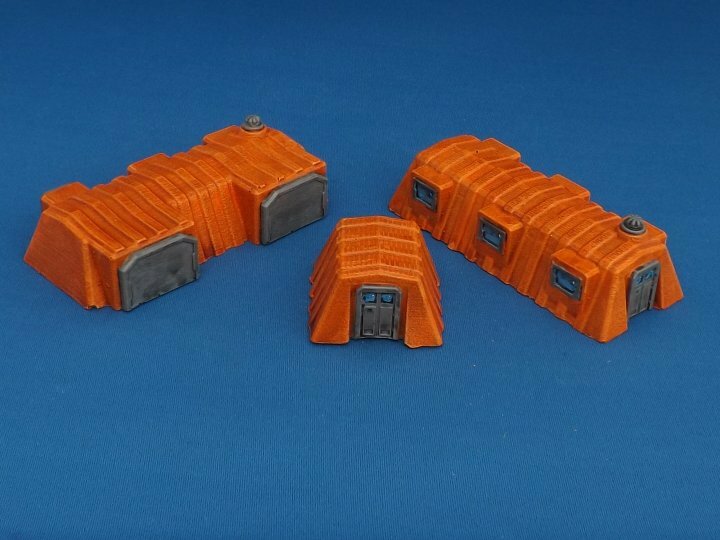 These are from our Research Base set of buildings that already feature in both 15mm and 6mm. They depict a style similar to an Antarctic station, hence the bright orange colour scheme on these ! We’ll have stock at SELWG next weekend – and this is as good a time as any to remind you that any preorders really need to be with us by the end of this weekend (the 14th) so that we have time to get them ready for the show. This entry was posted on Saturday, October 13th, 2018 at 10:04 and is filed under News. You can follow any responses to this entry through the RSS 2.0 feed. You can skip to the end and leave a response. Pinging is currently not allowed. I was hoping these would be released in 10mm – mainly because I hope they’ll look suitably large (but not too large) for 6mm.